Okej, här kommer första kapitlet. Det är på engelska. Skriv gärna vad du tycker om det. Men tänk på att detta är första gången jag skriver så ha inte för höga förväntningar. Och om du inte förstår engelska så bra så är det ju bara att klistra in det i Google Translate. Ha en bra läsning! I followed them, and got into a room which was bigger than my last house! “Wow, it’s big in here!” “He he, yeah we are a large family.” I looked around and saw that the room was full of vampires. “Bree let me present Edward, Alice, Jasper, Rosalie and Emmet.” “Hi” I said nervously, “Hi” they all repeated Even if Jasper said it kind of quiet. “Look how little and cute she is.” I heard Rosalie whisper to Emmet. “I know but she can take care of herself I think” Emmet responded to her, whit a smile. “Have a seat Bree, Esme will soon come whit more blood.” Carlisle said and pointed at the cough. “Thanks” Then I sat there a while and studied all of them, Edward just stood there whit his eyes fast at one point that didn’t exist. Alice and Jasper where kissing and whispering things to each other. They looked so cute together. Carlisle were reading a book, Esme she was out getting more blood for me. Rosalie and Emmet walked out for a while ago. What really happened in the meadow? Most of all I remember that human. I saw a movement in the corner of my eye. Edward was now watching me. The mind reader, I bet he is reading my mind really carefully now. Was that a nod I saw from him? Okay it was a nod. It was boring here; all I could do was to just sit here. And I was so thirsty! Suddenly Edward was right beside me. “Esme is soon coming back whit some more blood. I hope you don’t mind that it’s not human blood” “It’s fine” but I was so thirsty, it wouldn’t be fine. Ooh no, he can read my minds. “Its fine I promise, I’m just so thirsty! It will be good whit animal blood, I don’t need human blood.” I started to babble. “Calm down, we know it’s not easy. We all have been through that too. Jasper...” he said and pointed at Jasper. “…is still having a struggle whit it. But Alice is a good help for him. “I still didn’t understand, in the meadow it was almost impossible, and I was threatened to death if I even touched her. And they all was like one meter away from her. “But how can you stand it, I’m sorry but that girl at the meadow smelled so god. How do you handle it?” His face softened. “Because I love her, I love her whit my whole heart”, he said that whit such a soft velvet voice that I was like hypnotized. But how can he love ha human. And how can he resist killing her? “I could never hurt her. I would hurt myself by hurting her.” And whit that said he left. I watched him as he went out the door. He was beautiful, but nothing for me. Okay, let’s start. “Riley didn’t turn us into vampires, Victoria did. Riley just picked us up and took us to her. It was dark, then all I can remember was pain, for almost three days my whole body was on fire. Then he took me to the other vampires. It was like hell there, he told us, that we would explode if we walked out in the sun, so in the days we all were stuck in the basement. And there was always a fight going on. I wanted to be alive so I hide behind Fred. No one noticed him, because he has a gift. Just like Edwards, he can make you feel ill, and I mean very ill. No one could look at him. But in one way he accepted me and I couldn’t feel anything. And I survived there. Then when it got close to the day of the fight, we trained in the night. Made up tactics and things like that. Then we came to you and fought.” I left some things out, like about me and Diego. It wasn’t necessary for them to know that. “Fred left us, just before the fight. I didn’t because I had to look for a person.” “Who was that?” Carlisle asked. “Diego, he discovered that we can be out in the sun. He said that to Riley, but Riley killed him.” I remembered that day in the cave, when I thought I would explode in the sun. I thought Diego would explode, but then in the sun; it was like thousands diamonds on my skin. It was beautiful. I was beautiful. “Did he tell all the others to? How could the rest go out in the sun?” Carlisle asked a lot of questions, but I didn’t mind. I hadn’t talked a lot for a while. “Riley said that there were four days a year we could go out in the sun. Everyone was very skeptical about that, but they got out after a while. And he said that you guys didn’t knew that we knew. So we would have an advantage against you. But we didn’t know that there were werewolves involved. So there wasn’t we that had an advantage, it was you. ” I remember when I saw them, I got really surprised then. And they had this awful smell. But that was nothing against Fred. “They didn’t really tell you the truth.” “Yea, I know, I kind of found that out by myself.” I said whit a smile. “So…” I didn’t know if I should rush it so, but I wanted to see him. “… can I go and search for Fred now?” I looked at Carlisle. “Yes, but there are some things you must know first, some rules. For the first, you can’t reveal yourself for the human. Ore else the Volturi will come and….. kill you.” “Volturi? Who are they?”I had never heard that name before. “They were the ones in the meadow, they whit the black caps.” Ooh, I definitely didn’t want to get in trouble whit them. Just to think of the pain Jane’s smile caused, made me feel uncomfortable. I wouldn’t reveal myself. “Of course you can show yourself in daylight, if there’s no sun. But wear contacts then. “Carlisle said. “We have some contacts, if you would like to have them you can.” It was Alice who said that, that was the only thing she said, I have never heard her talk before that. She had a smooth voice. “Yes, thanks.” “Will you continue too drink animal blood? I hope you do.” “I think I will, but it will be hard.” “I know, but you will do fine, or won’t she Alice.” I looked at Alice; she stood still as a statue and looked straight forward. How could she know? “Right now she will, but if she change her mind I don’t know.” She said still standing still as a statue. “How can she know that?” I was confused. Alice could see if I was going to drink animal or human blood? That’s weird. And before, when I was going to run away, I suddenly felt so calm. Is that she too?? Edward must have read my mind, because he had a fast answer. “It’s their gifts; Alice can see the future right now. And Jasper can control what all the persons in the same room feel.” Ooh surprise, they all have gifts. “Cool.” I wonder what I would do if I could see in the future. Then I came up whit something. I didn’t have a gift. I felt kind of sad; I also want to be special. “Don’t worry, there’s only Alice, Jasper and I who has gifts “ “And now we are ready to let you go, but not alone. Who will come whit her?” Carlisle looked around in the whole room, on everybody. “I won’t, I got to take care of Bella.” Edward said. “I can, I’m sure Emmet doesn’t mind to come whit me to.” At first Emmet seemed a bit surprised then he gathered himself. “Of course I don’t mind. When are we going?” Now Emmet was exited, I saw it on him. “Whenever you are ready.” Carlisle said. 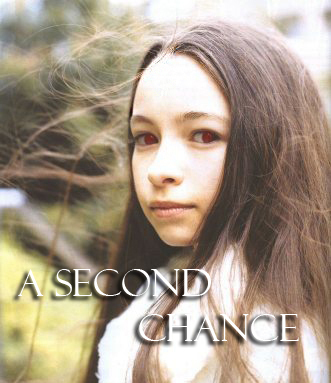 A Second Chance handlar om Bree Tanner. Samma Bree i eclipse och som i Bree Tanners andra liv. Fast hon dog inte, och här är fortsättningen, A second Chance. Nu har jag första kapitlet klart. Tyvärr för er som gilalr att läsa på svenska, så blir det på engelska. Det är så mycket lättare att uttrycka sig på engelska. Första kapitlet kommer ni att få ikväll.